Sysdex uses two different types of system, the first is our ClearSpan, this uses GRP decking where as our Triple Bay system uses precast or in situ concrete. Downloadable PDF presentation with technical detail, panel drawings and specifications. This is our GRP system, it utilises hollow section steel so as to minimize the number of internal columns whilst still prividing spans of 15.6m and 16.1m which is perfect for the parking of 2 cars with a central roadway of either 6m or 6.5m. The opposite grid has columns at 2.4m, 4.8m or 7.2m to allow maximum flexibility for the end user. 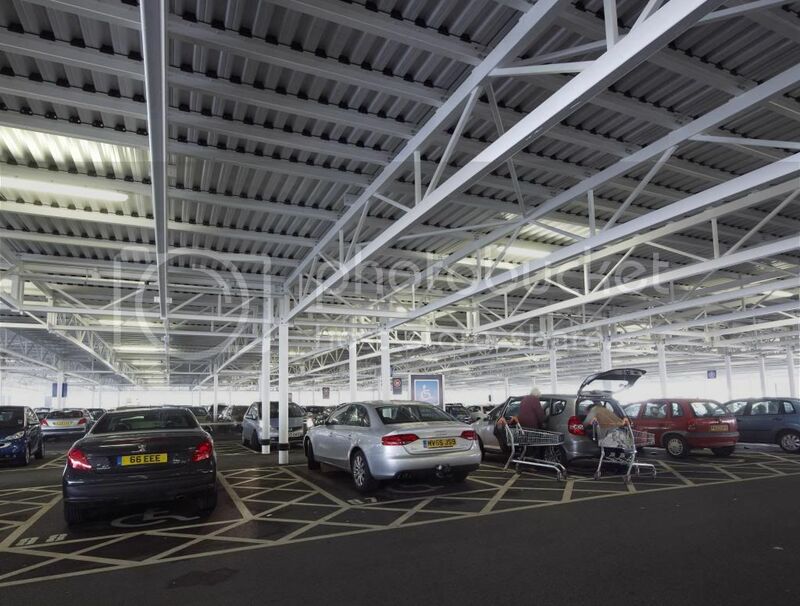 Due to the truly modular nature of both systems there is a wide range of layout possibilities and overall car park sizes that can be achieved. The final layout can also be easily modified to suit any future developments or possible rearrangements of an existing layout.Both systems have the flexibility of being utilised as permanent or temporary solution with the capability of being multi-storey. There are columns within every third party bay or 7.2m centres. Not all sites require foundations, however this is entirely dependent on ground survey conditions and client specification. If foundations are required there are 3 options which are dependent on ground conditions. The first is a mass poured concrete pad foundation on every column, a screw pile with a small pile cap and lastly a driven ductile pile with a small pile cap. This will be carried out prior to the commencement of the deck's site construction, with minimum disruption to the normal operation o the exisitng car park. Due to the nature of site conditions, the ramp is generally a bespoke item tailored to suit each individual site. The ramps are constructed of standard structural steel sections. Ramps with steep gradient have transition sections at the top and bottom as per design recommendations, thus removing trip points and allowing for a smooth motion for vehicular traffic. Ramps are typically finished in concrete with ramp heating as an option at the cients request. The deck modules and infill's are sloped to allow for water to naturally run off to a linear grating or slot which is situated at the front of the parking bays on one side only. There is a bespoke gutter box positioned directly underneath the grating or slot which collects the water so it can then be released into the existing storm water sewer. Any water which permeates through the deck surface is then collected by the underlying profile sheet and flows into the gutter box as previously described. The underside light fittings typically give an average 100 lux lighting level which are incorporated in each module unit. There is an emergency lighting system should a power failure occur. The deck is illuminated via stylish 3m high lamp standards at agreed grid positions, this will again allow the end user to select the luminescence requirement to suit the individual location. These panels have a life expectancy in excess of 50 years and excellent thermal stability capable of withstanding a temperature range of -40 to +150 degrees Celsius. They can also be manufactured to a wide range of colours however black tends to be the colour of choice. Sysdex has redeveloped the previous GRP panels and has now altered the design process to be a pultruded section rather than hand laid. This has now maximized the strength of the panel and provides a single panel some 11m x 2m which retails at £255 per square meter. Load testing has been carried out on the composite decking by both Messrs Sandberg and Queen Mary University to provide structural integrity data on the panels under the designed UDL and point load conditions. Test reports are available upon request. BS EN 1991-1-7:2006 Eurocode 1 - Actions on structures. General actions. Accidental actions. BS EN 1991-1-4:2005 Eurocode 1 - Actions on structures. General actions. Accidental actions.